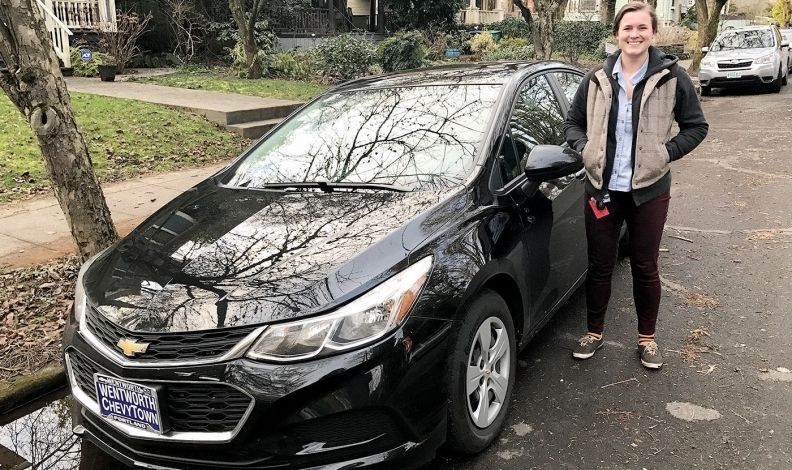 Taylor Stablein, 23, had relied on public transit in Portland, Ore. -- until she got a full-time job. She leased a 2017 Chevy Cruze. WINDSOR, Ont. — About half a million millennials have entered the United States workforce since June 2016, and that’s good business news for those Canadian businesses that manufacture vehicles and auto parts, says Export Development Canada’s chief economist, Peter Hall. Canada’s auto sector exports to the U.S. between 80 and 85 per cent of all automotive parts and vehicles it manufacturers. More U.S. buyers simply means more business for Canada. Hall said millennials are “first-wave buyers” and they have been absent from marketplace for about seven years. The average age of a U.S. vehicle is 11 years, Hall said. So, whether millennials buy new or used, it’s a unit gain for the auto industry, he said. Hall said the United States has a 4.3 per cent unemployment rate and will continue to add an average 200,000 jobs per month in the foreseeable future. “If that kind of juggernaut continues, you have got to tap into those parts of the market that have been ignored and millennials are a key one,” Hall said. Another 1.5 million millennials are still looking for work and represent a large number of potential first-time car buyers. He says the auto industry is looking at another three to five years of sales growth, despite a record year in 2016 and somewhat sluggish start to sales in 2017. Americans bought a record 17.5 million vehicles in 2016. The seasonally adjusted, annualized rate of sales in the U.S. fell to 16.7 million in May, down from 17.2 million in May 2016, on weaker fleet volume across the industry. A survey of 11 analysts by Bloomberg in late May put the average estimate for May’s SAAR at 16.8 million. “I think it’s quite reasonable we would have U.S. sales levels at those rates,” Hall said. General Motors Chief Economist Mustafa Mohatarem had numbers to support Hall’s outlook on millennials. The automaker told the audience that younger people (those under the age of 35) accounted for 19 per cent of the giant automaker's sales in 2016, up from 14 per cent in 2010.